Cambridge BHS successfully concluded the term by having various activities last Aug. 30, 2018. From shake and ice cream making for the Toddler and Junior Nursery 1 class, the Senior Nursery kids had their full Senior Cafe set-up. The Junior Nursery Vertical class, on the other hand, had their planting activity and made a pledge in helping the environment one plant at a time. 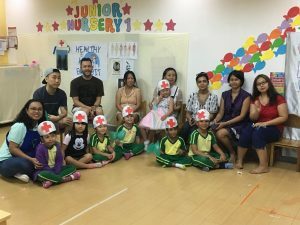 Finally, for the Junior Nursery 2 and the Kinder kids, they had their dental experience with our kid dentists and an experiment to represent the internal organs, respectively. As a way of giving back, students and their parents donated milk for the benefit of the Grace to Be Born Foundation, and hygiene kits for the “Save the Child, Save a Future” Ministry.